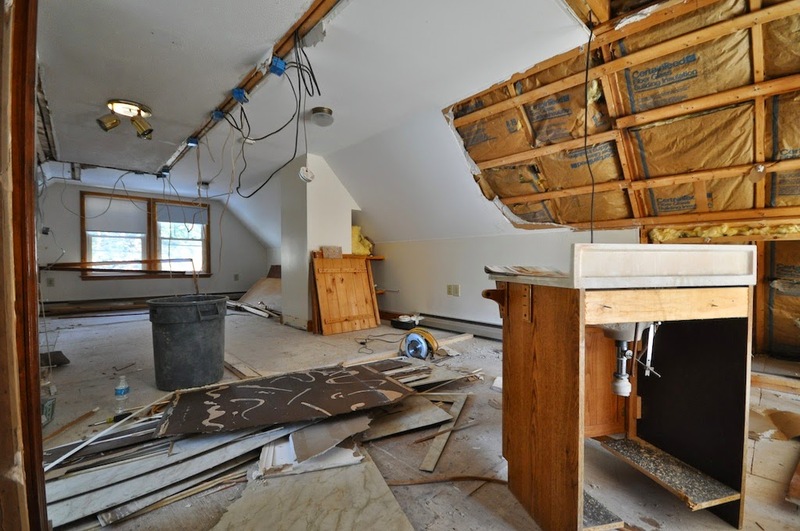 SoPo Cottage: Now the Real Fun Starts - Demolition!! Okay, so it's dirty and dusty, but you just can't beat demolition for getting a lot of satisfaction in a short period of time!!! With the floor plan in place, we were ready to get started. 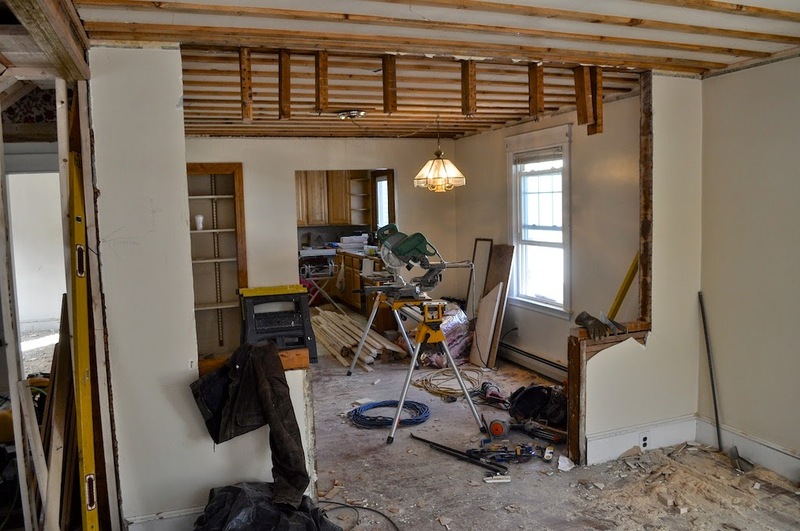 And we had quite a bit of demo required in this house. 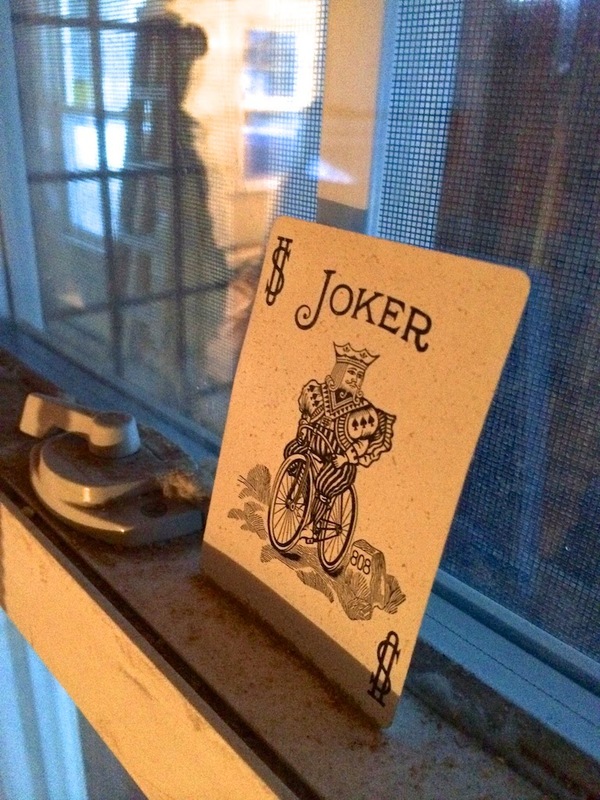 But we're hoping this card they found in the walls won't predict what we're going to find! 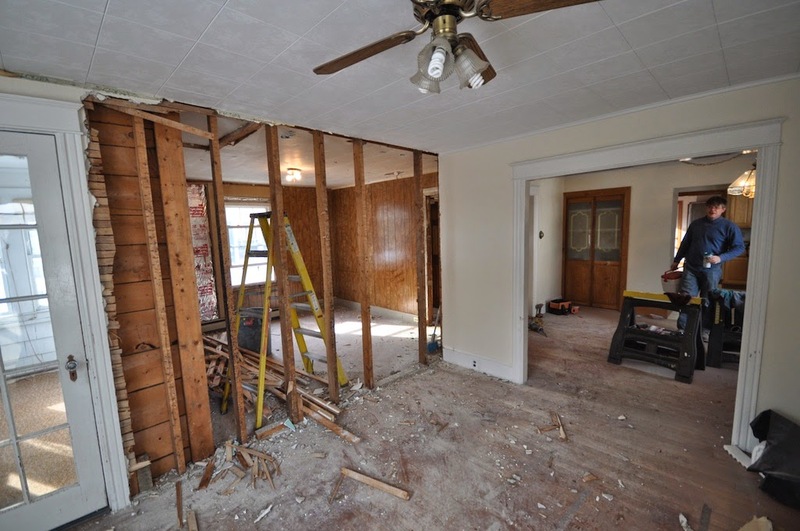 We started by opening up the wall between the living room and former bedroom - to create the new large living room. It already feels so much bigger and brighter! 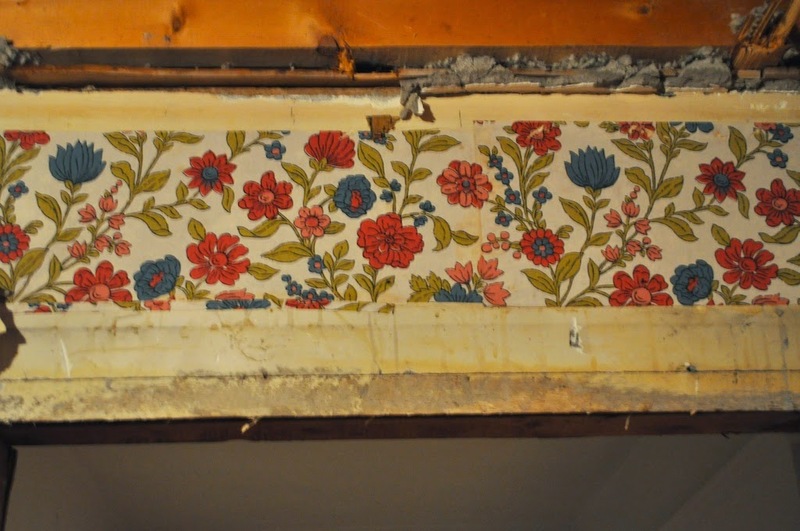 Check out the snazzy wallpaper we found behind the bedroom paneling! 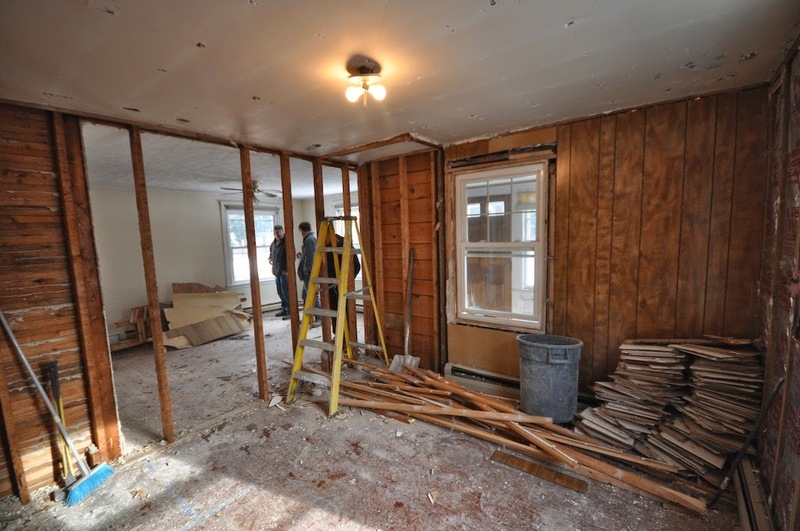 Next, we opened up the space between the living room and dining room for the Craftsman Colonnades that we'll be adding. Again, just opening up that little bit of wall makes an enormous difference in how the space looks & feels. Love it already (of course it will be much nicer without piles of debris and tools everywhere)! But then we got a surprise. 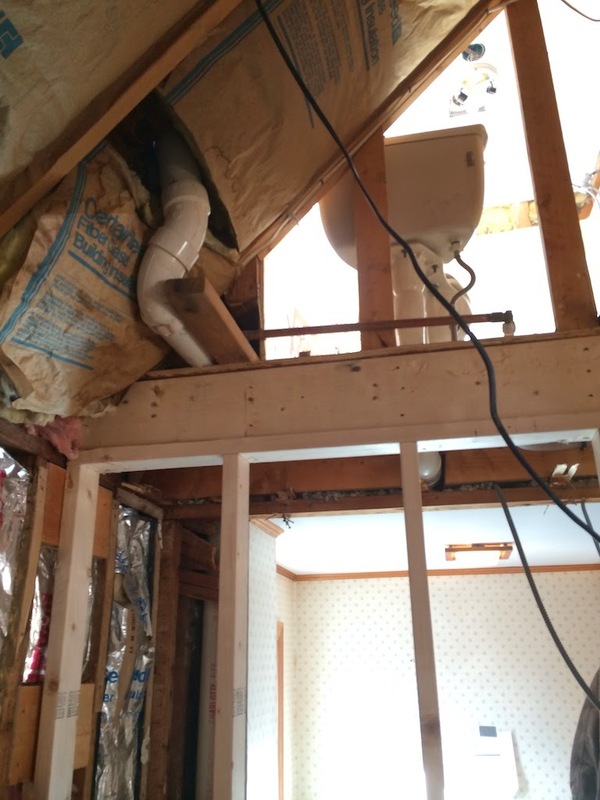 Typically, when you have two bathrooms stacked one above another, all the plumbing is on the same wall. That wall is thicker and is referred to as the wet wall. So we just assumed that was true for this house. Surprise!!! 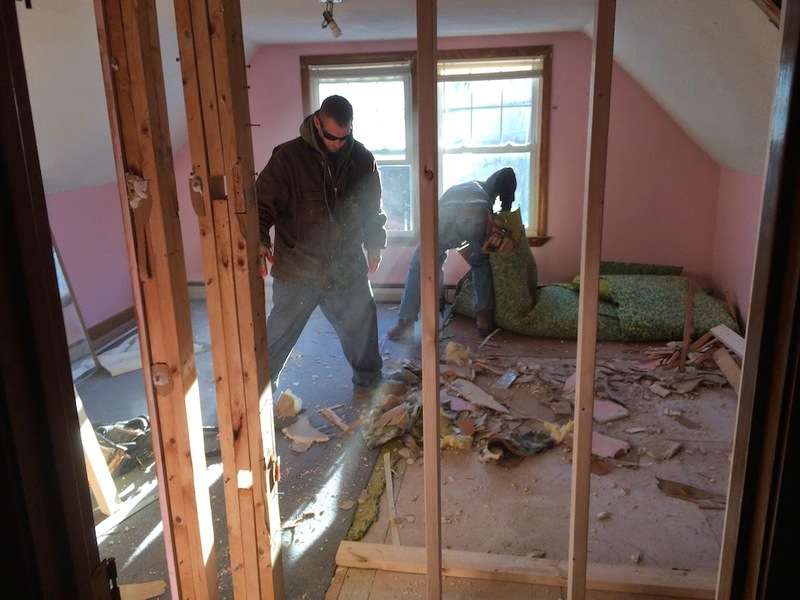 The first floor bathroom wall was 20 inches away from the second floor. Remember how I was going to save money by not moving any plumbing? So much for that idea! But the good news is that the first floor bathroom just got quite a bit bigger. Which will be wonderful! 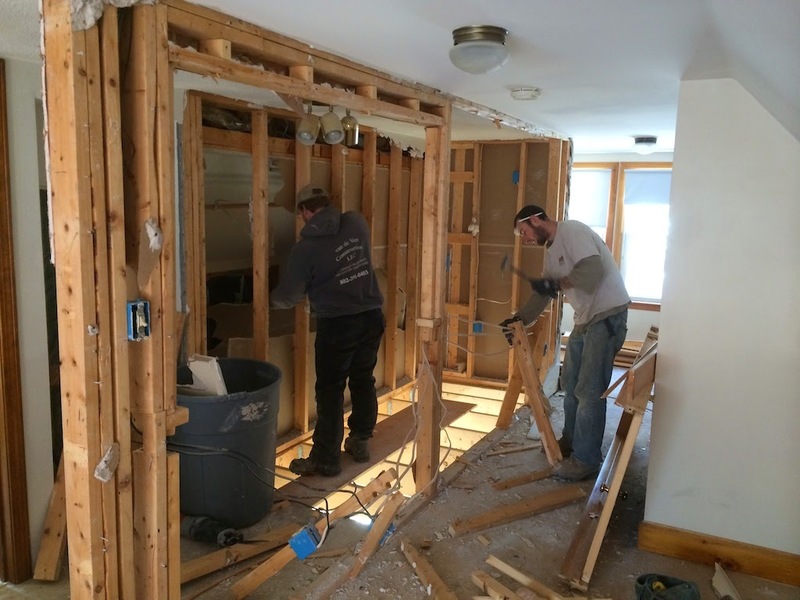 We removed the closet from the breakfast room. With the walls gone and the vaulted ceiling, the room suddenly seems so much bigger. And we're excited about the craftsman style mud bench that we'll be adding soon. It will go right next to the back door. Upstairs, we've cleared out the back of the house. There were lots of walls back there, around the old staircase. And we need them out of the way to create the new master bedroom, walk in closet and loft space. But the biggest change? Creating the new staircase in the front of the house. 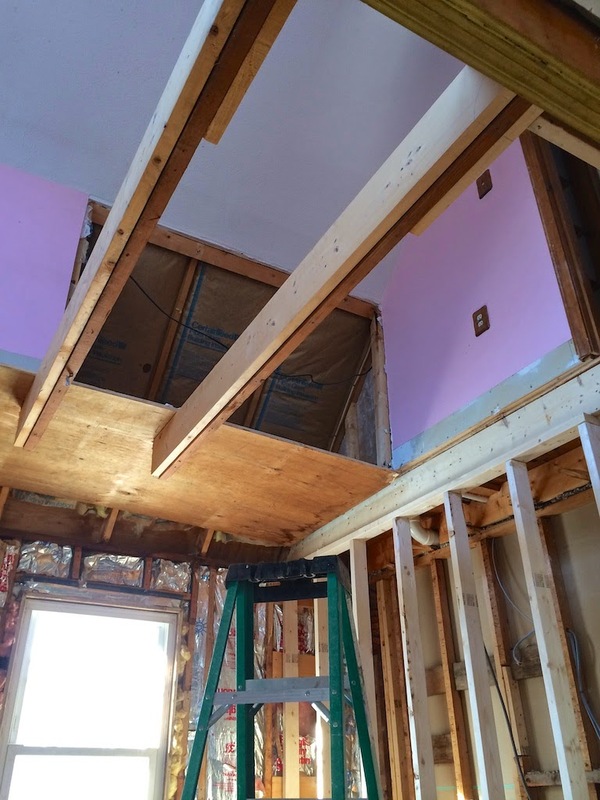 It meant opening up the ceiling/floor and creating a structural opening. It seems so strange to be able to see upstairs from this former bedroom! Next interior project - we'll get the new staircase built and then we can tear out the old one from the back bedroom. 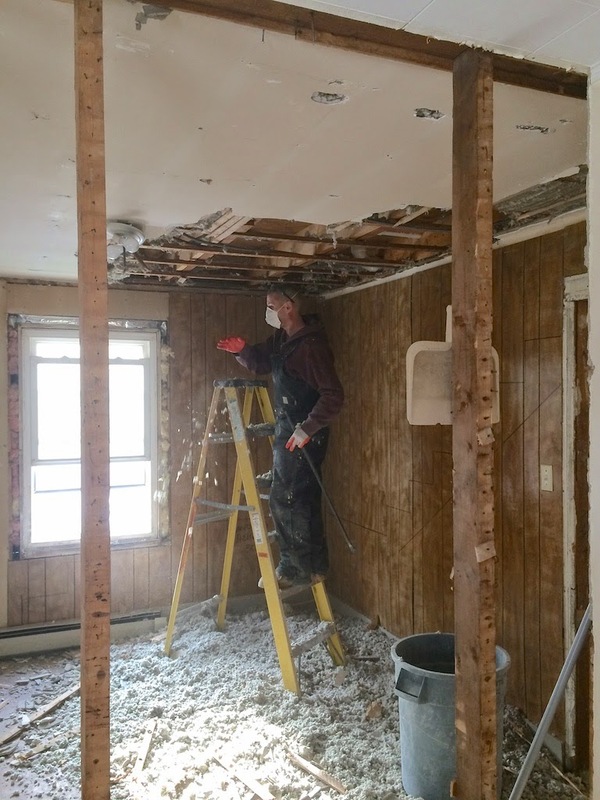 Boy when you guys do a reno, you really bust up the place ;-) It won't be the same old house soon :-) Awaiting more pics as the process goes on. Ha ha, we did end up making lots of changes! Can't wait to share them with you! Completely agree with the first comment; can't wait to see the finished house after ye have worked yer magic on it! ps re the love letters in the New Englander I came across a reference to the couple; it was someone searching for them. The email address is years old but it might help your search!! If you like to email me I can pass on that link. Regarding the Love Letters, one of my wonderful FB readers tracked down the grandson of the author. I called him and left a message, but he never called back. My guess is he thinks I'm some crazy woman!!! I left the letters in the house, in the old china cabinet for the new owners. They were thrilled to have an artifact from the house's past! Thanks Laurel, I bet they were thrilled! That is a pity their Grandson didn't want them; I think maybe it was something to do with his Grandparents! Anyway if he does decide to look for them you can direct him to the new owners. Looking forward to seeing how this house turns out; would love to take a tour when yer done but I'm afraid I live on the other side of the Atlantic in Ireland! Well, we'd love to meet you if you ever come to Maine! It's a wonderful place to visit!!! 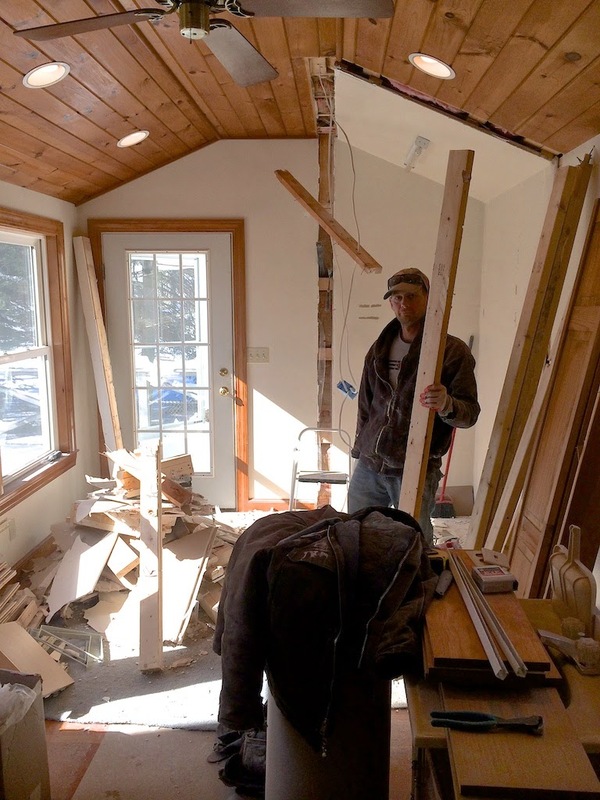 When my parents tore down their old farm house (a very simple Craftsman style) they found old newspapers and what was left of oats --after mice had had their fill years ago!--- Both were used as insulation! Imagine that! Wonder how the builders thought the oats would somehow NOT be enticing for mice. ;-) And yes, in case you're all wondering, it was REEEEAALLLLLY cold in the winter months with that as 'insulation'. Coupled with the fact that all we had for heat was an oil burning stove in the living room and what heat came off the kitchen stove. Brrrrrrrr! Demo is such fun. When we renovated our 100 year old house in Nanaimo, British Columbia we found newspapers under the linoleum from the twenties. You have a dream job, Laurel. Love to go through these renovations with you. Thanks so much. Isn't it cool what you can find in these old houses? I had a note yesterday from a woman that found 1940's 'girlie' magazines when they did their remodel. Cracks me up!! And I love old newspapers. It's so fascinating to see what was newsworthy when these homes were built. But dream job? Here's the post I did last year on my 'dream job'!!! http://www.sopocottage.com/2013/03/living-dreamreally.html Ha ha, remodeling isn't all the pretty stuff. Thanks so much for posting the floor plan! It makes this post soooo much more interesting. I am a very literal person, and it's always important to me to be able to visualize the layout! Hmmm...I'm not entirely sure that is normal...Anyway, love having the floorplan to refer to! By the way...love your blog...you're living my dream! Totally normal Julie!! That's why I post them, because I need that point of reference as well! !